Photo: Girls enrolled at the school pose for a photo in one of their new classrooms. We are happy to report that our rural primary school students in Uganda just completed a successful school semester on December 9th. They enjoyed studying math, English, their native language of Bantu, 3 levels of literacy classes, and a children’s Bible class as the school is led by local Christians. In other good news, last year we were able to buy all of the children new uniforms which they wear on certain days of the week and to special functions. Some of our children won academic awards for good discipline and daily participation — their awards included books, pens, pencils, mathematical materials, soap, and candy. Their parents and people from the local community were invited to the school that day to watch their children participate in various presentations which was a great encouragement — to see what the children can do now which they could not do before they enrolled at the school. We want to share the story of one child who has benefitted from the Mairinya primary school. 5 year old Hope became an orphan when both of her parents died in a car accident. When we discovered Hope, she was living with relatives who were very poor, living below the average poverty line. Thus, they were not able to take care of her. They could not even afford clothes, food, or other basic needs for her, and they could not afford to send her to school. But now she has been with us at the Mairinya primary school for two years. The school provides her food, clothes, and other basic needs as well as providing a free private education for her. Hope is now very happy as her teachers and school leaders show her the love of Jesus and equip her with literacy, knowledge, and nutrition. 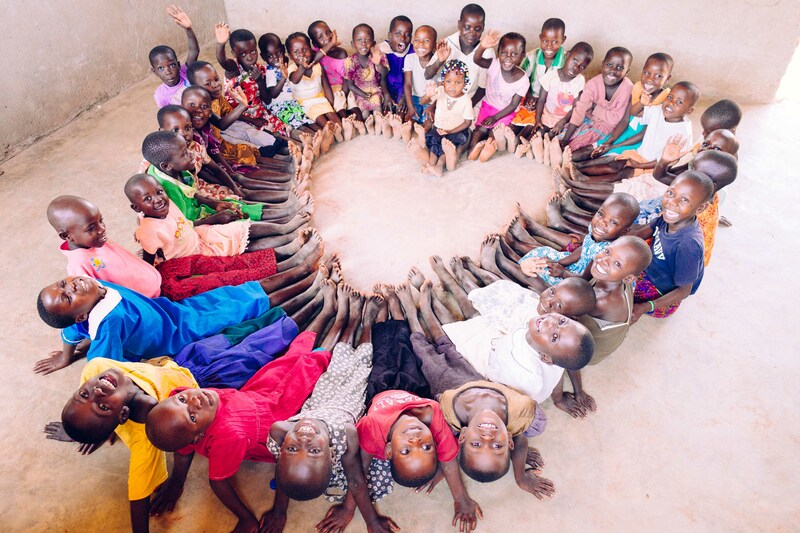 With your support, we hope to establish a small orphan home that can care for such children in need in this remote region of rural Uganda. Photo inset: (Top-left): Our children at the Mairinya primary school receive a fresh cooked breakfast and lunch five days a week. 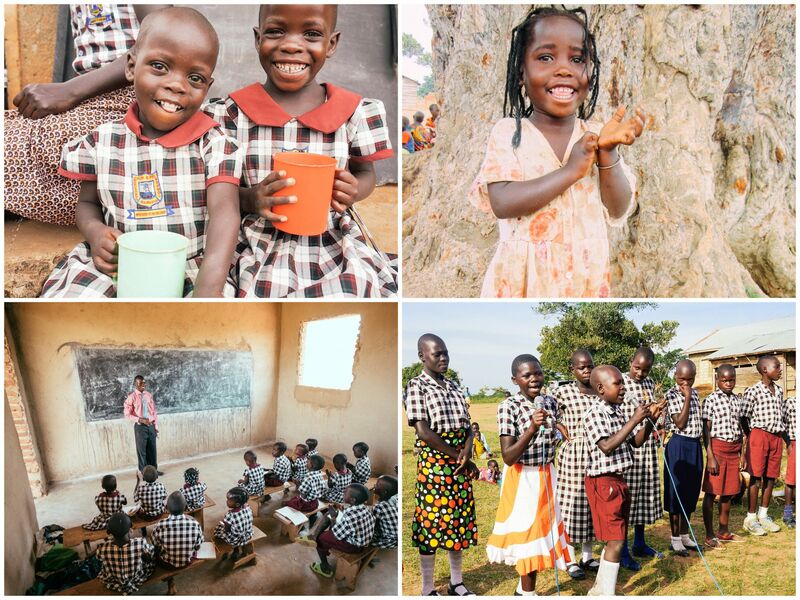 (Top-right): Hope is one of the children who has benefitted from our Mairinya primary school, where she receives a quality education, food, clothes, and other basic needs. (Bottom-left): In 2014, we built a permanent, storm-proof school building, which also features large chalkboards built into the walls. (Bottom-right): Recently, parents and people from the local community were invited to celebrate our Mairinya students’ completion of a successful school semester. Thanks to our hardworking native team, our children at the Mairinya primary school receive a fresh cooked breakfast and lunch five days a week. Vegetables and potatoes from the farmland help put nutritious, organic ingredients on their plates every school day. Serving 200 children ages 3-13, the entire village feels empowered knowing that their children have access to a local school and nutrition. Previously the children of Mairinya had to walk a very great distance to the nearest government school which was already severely overcrowded. This village has never had a school before, we are the first one in the area. We opened it in 2012 with what little resources we had at the time. As our main campus high school had required the bulk of our financial and administrative focus at the time, we were not able to properly equip the school and could only afford to build a rudimentary shelter with 3 classrooms. But we knew we needed to start somewhere because we felt that access to education, no matter how basic, was critical for the children of Mairinya. Then in 2014 we received a generous $40,000 gift for a permanent, storm-proof school building along with additional land for future expansion. The children are enjoying the new building, especially for its concrete floors and strong roof. Their old facility had only dirt floors which would turn to mud anytime it rained. The new classrooms also feature large chalkboards which are built into the walls; quite a rare site in rural Ugandan schools. Many schools in this region meet under trees where the chalkboard is severely weathered and simply nailed onto the trunk of the tree. With your support, we hope to further bless the children’s pursuit of a good education by providing them with more textbooks, more desks, new school uniforms, solar electricity, new doors and window shutters, a fence to surround the school premises, and more classrooms.